Most students at one time or another have had the feeling that the professor up there in front was rambling on in a foreign language. And so it really was for many centuries in European universities, where lectures were routinely held in Latin. Antonio Genovesi's students of political economy at the University of Naples in 1755, thus, must have been pleasantly surprised when the professor delivered his lectures in Italian. He was "the first," according to a number of sources, though it is not clear exactly what that means —the first in Naples, the first on the Italian peninsula, the first in Europe? It is not even clear if he lectured in the northern language of Dante or the home-grown Neapolitan variety of Italian, a vibrant and living language at the time with an impressive literary history of its own. Whatever the case, it still made old (he was 43!) professor Genovesi a pretty good guy, I'm sure. Genovesi was one of the prominent members of the Neapolitan Enlightenment of the mid-1700s, a school that includes Gaetano Filangieri, Vincenzo Cuoco and Vincenzo Russo. As a young man he was educated for the church but gave that up. He then studied law but eventually devoted himself to philosophy. That is not as abstract as it sounds. 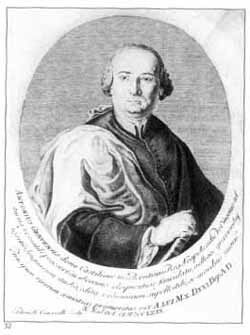 Genovesi wrote the first systematic and complete work in Italian on economics, his Delle lezioni di commercio (1767) and was, in fact, the first professor of the newly founded Chair of Political Economy in Naples in 1754, the first such chair at a European university. He stressed that human wants were the foundation of economic theory and that labor was the source of wealth. He preached the education of the masses (no doubt the reason behind his lectures in Italian) and the abolition of feudalism. He wrote his early works in Latin: Disciplinarum metaphysicarum elementa (1743) and Elementa artis logico-criticae (1745). His major work, the Lezioni di commercio, was in Italian, as was his Philosophical Meditations (1758). He was born in 1712 and died in 1769.